Soaring sand skyscrapers and monumental mounds. 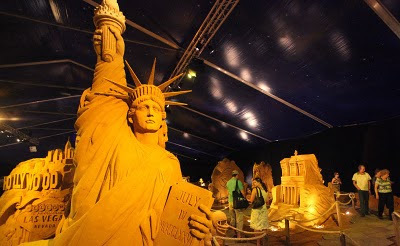 This past summer, 40 artists from 9 different nations sculpted scenes made of sand in Blankenberge, Belgium. The annual sand sculpture festival’s theme this year was aptly-named 'Around the World.' A total of 171 scenes have been sculpted: 73 European, 43 Asian, 19 African, 17 North American, 10 South American and 9 Ocean scenes. Some 40 countries on six continents are represented in minuscule grain depicting world wonders, the most visited cultural monuments, and meet some of the greatest heroes of our history. Organizers of the event left nothing to chance for the delicate creations and set up many artworks under tents. Check out more creations in this photo gallery. 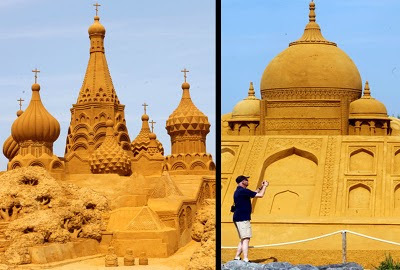 I’ve written in the past about other sand structures.